Practicing mindfulness meditation is one of the simplest ways to relax. It’s even simpler when you can meditate in a calming space. Thus, you may want to know how to make meditation gardens. This type of serene setting doesn’t need to boast thriving plant life or gorgeous flowers. It just needs to be a place where you find it easy to focus on the present moment. Keeping reading for tips to learn how to make your meditation garden. Our team at Watersavers Turf will also be happy to explain how to make a meditation garden with our products. Start planning your garden by thinking about features which help you relax. There’s no “wrong” design. Some people like gardens with artificial grass surfaces or walled-in gardens, or they might want to add water features. It’s all up to you. Japanese – These gardens tend to be sparse. Their surfaces often consist of sand or gravel. English – Walled-in gardens you might see in Victorian period pieces are very private if you have neighbors. Chinese – Chinese meditation gardens often include smooth stones arranged in patterns, fish ponds, and other natural features. Australian – Australian gardens are designed with shade in mind. Large trees loom over them to block the sun. Terrain – Make sure the terrain is as flat as possible. Noise – The space should be calm and silent. Add walls or other sound buffers if it’s noisy. Structures – A structure can make your garden a sanctuary from the world. You might want to add a pergola, courtyard, or pavilion. Natural Elements – Tree groves can also add beauty to this space. Don’t neglect the natural features that are already there either. A calming view might look perfect when framed between a garden entrance. Draft your ideas on paper throughout the planning phase. Drawing up plans makes it easier to visualize the finished area. Synthetic Turf – Synthetic turf is a smart option because it requires very little upkeep. Again, this should be a space where you can relax. That might be hard if you need to constantly water and mow it. You won’t have to worry about these tasks with synthetic turf. Grass – Grass is an obvious choice. It may already be present. All you need to do is build the rest of the garden around it. Pavers – This surface is ideal if you want to design a path. That said, pavers are not easy to sit and meditate on. You’ll need another surface to go along with them. Bricks – Some people like their meditation gardens to evoke a feeling of oneness with nature. That’s why they choose bricks for garden paths or structures. Over time they’ll attract moss and lichen. You might like that worn, natural look. Artificial Plants – Artificial plants are easy to maintain and can add lasting color to an outdoor space. You may want boxwood ivy panels if your garden is walled-in, for instance. 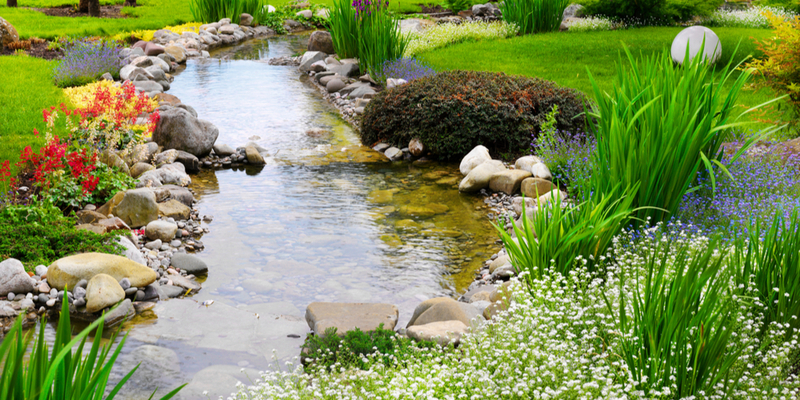 Water Features – A small pond or stream adds a serene character to a garden. Statues – These can be religious, or they can simply be statues that make you feel calm. Empty Space – You’ll want an empty space to meditate in, of course. That said, you might also want larger empty spaces for walking meditations. Altars – A religious altar is a nice finishing touch for some people. Do you need plastic plants for your meditation garden? Head to one of Watersavers Turf’s SF Bay Area locations to see what we have to offer. We carry plastic plants like boxwood panels, ivy panels, and faux grass, and we’re happy to offer free 1’ x 1’ samples of our turf. Chat with us online if you’re not from the area, or call us toll-free at 844-974-8873. We’re happy to ship our products to any spot in the Continental United States.